We started challenge #4 by discussing the idea of characters. I realized it is a difficult idea to explain without using the word character. We talked about that a character is the who the book is about but that ‘who’ doesn’t need to be a person – it could be an animal or a thing. I tried to use some simple examples such as the pigeon in Mo Willems Don’t Let the Pigeon Drive the Bus (example of an animal character), and Thomas the Train (example of a thing character). I sent Kaitlyn, Eileen and my niece Lyric to find a book with a character they all loved. The two younger girls really had no idea what they were doing, as I quickly realized when they both brought me ABC board books. Kaitlyn understood but was bringing me books she liked with more obscure characters. I went to her bookshelf with her to find some more well known characters that her sister and cousin might also like. First I suggested Curious George and was met with a look of disgust (not really sure why). When I pulled out Pinkalicious her eyes lit up. I quickly found Purplicious, and Goldilicious and rounded the girls up on the couch. We read each of the three books and then I explained their task to them. 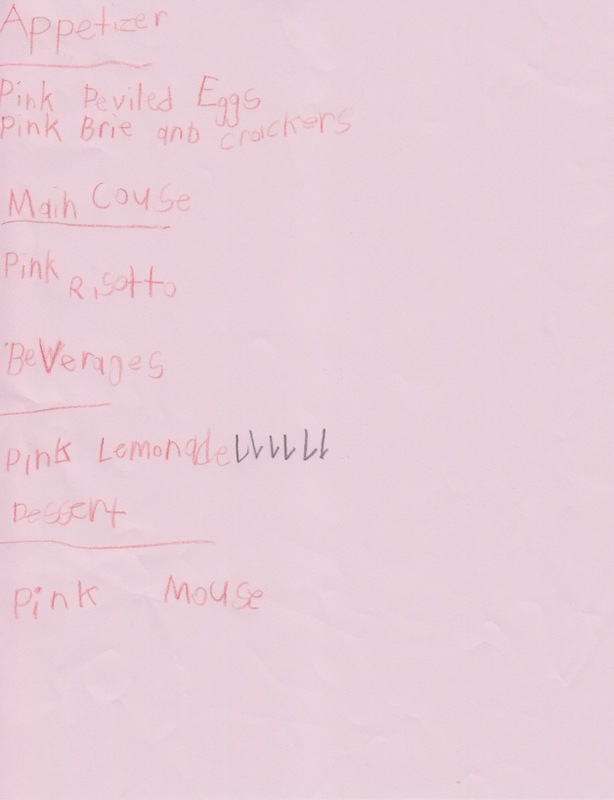 We were going to plan a dinner party and invite Pinkalicious to Dinner. Now that they had picked the character it was time to get started. First Kaitlyn helped me pick the menu. Don’t worry we didn’t eat mice for dinner – it is to read mousse. From this I found some recipes online and made a grocery list. My nieces were with is for a few days and they are vegetarian, which is why we had risotto for the main course. My kids LOVE risotto so I thought this was a good fit. There wasn’t too much for me to prepare. 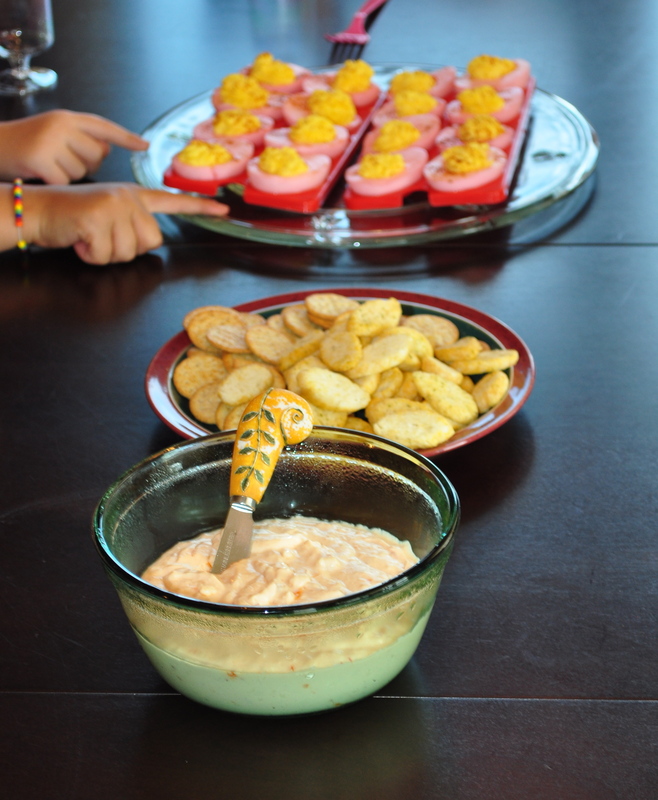 I had made coloured devilled eggs for Easter so this was pretty easy. All you do is soak the boiled egg whites in water with red food colouring for about 30 minutes before adding the yolks back in for devilled eggs. 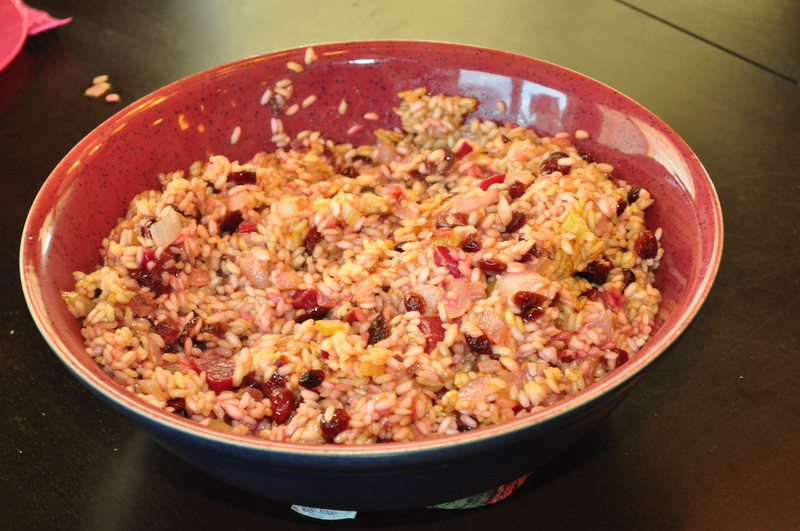 We found a pink brie recipe and pink risotto recipe online. We bought a mix for strawberry mousse at the grocery story along with pre-packaged raspberry lemonade. Not to much work but a successful, and kid friendly menu. 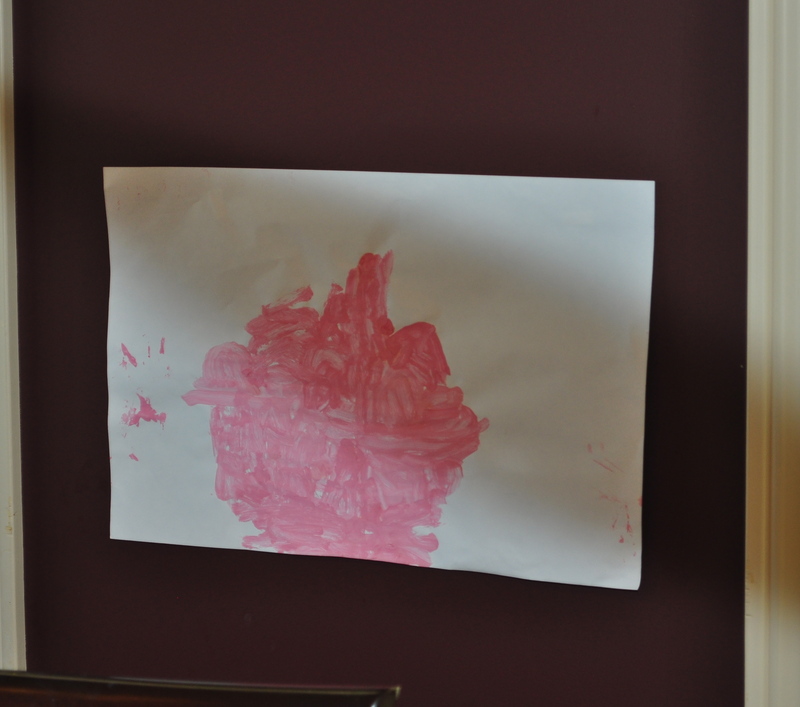 Before heading to the grocery store we decide to paint some pink pictures for the walls of the kitchen to decorate. This was inspired by the art class which Pinkalicious had in the book Purplicious. I got out the three paint palette trays I had picked up at the dollar store a few months ago and mixed red and white together to make a variety of shades of pink. 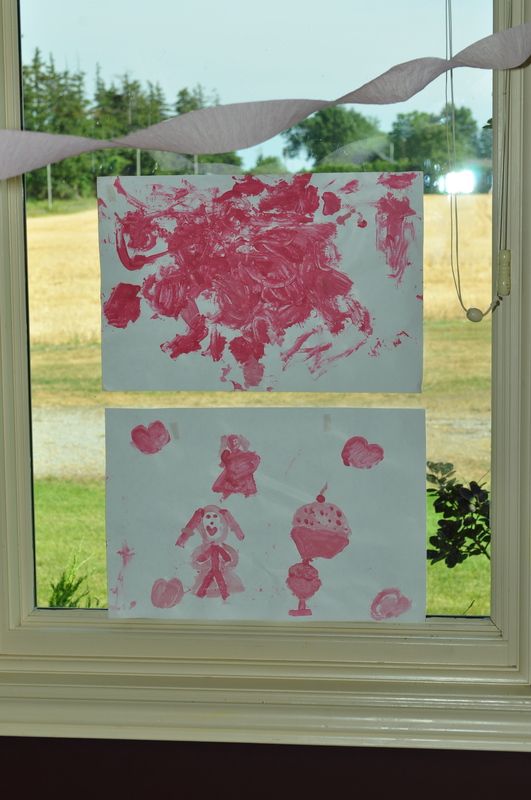 I gave each of the girls a large piece of painting paper and let them create. I love how Eileen has become so meticulous with her painting. She decided she would paint a cupcake and took her time and patience and it looks like a cupcake! After we returned from the grocery story the girls set the table with Grandma while I worked on the food. We searched the house and pulled out everything pink we could find. I managed to find 8 small pink plastic plates along with cutlery from our Princess Tea Party last May. I also found some streamers and random balloons in the craft bin in the basement. After that Kaitlyn quietly disappeared – and I didn’t realize how long she was gone unit she came back upstairs with her creation! 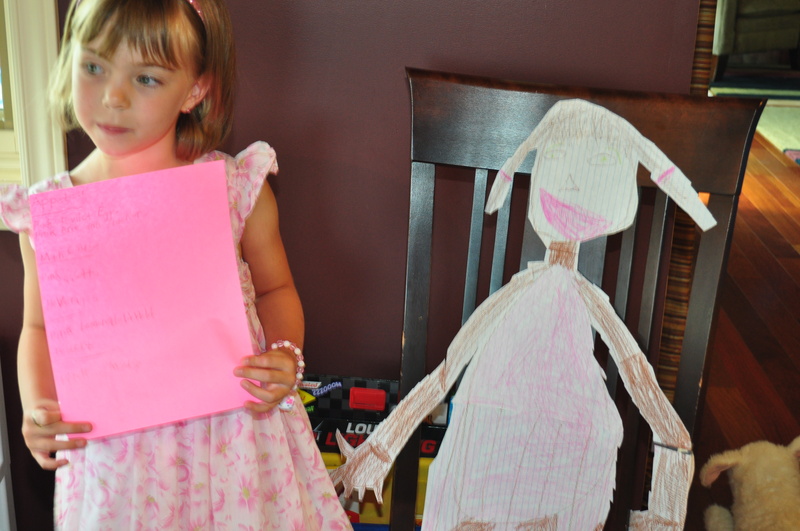 She had decided that we needed a real Pinkalicious for our party so she made one! This was entirely her idea and it was AWESOME! 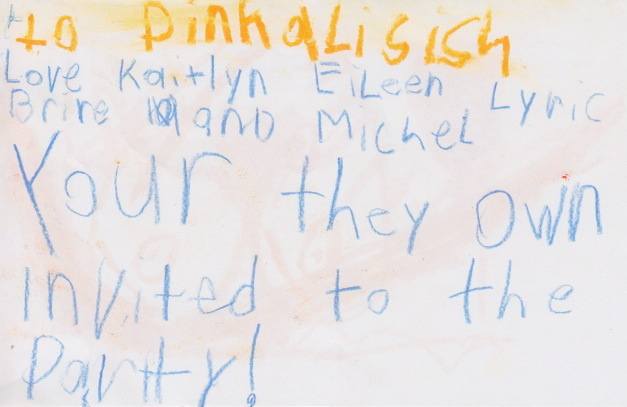 She also decided that Pinkalicious needed a proper invitation so she disappeared back downstairs to her craft centre and returned with an invitation. Everything was ready so the girls ran off to get dressed. They found the fanciest pink dresses they could in their closets. 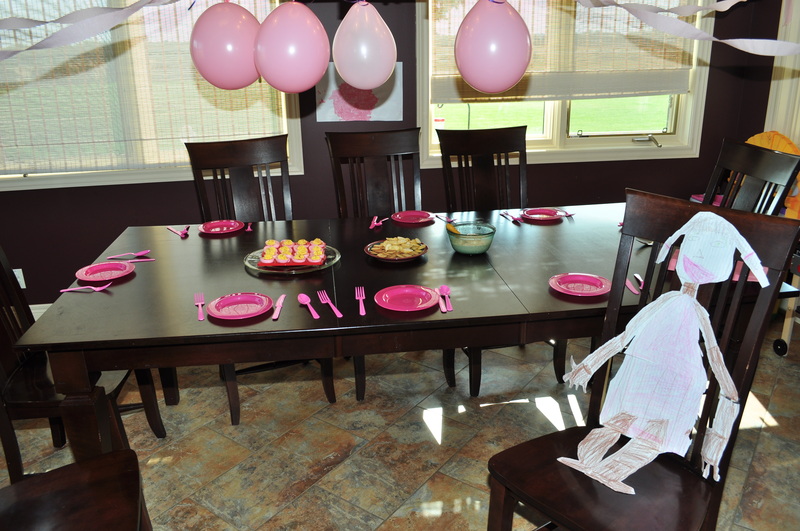 The table was set and Pinkalicious was waiting for her hosts! Appetizers were ready to be enjoyed. Yes, I know the crackers are not pink – I could not find any pink crackers in the grocery store. 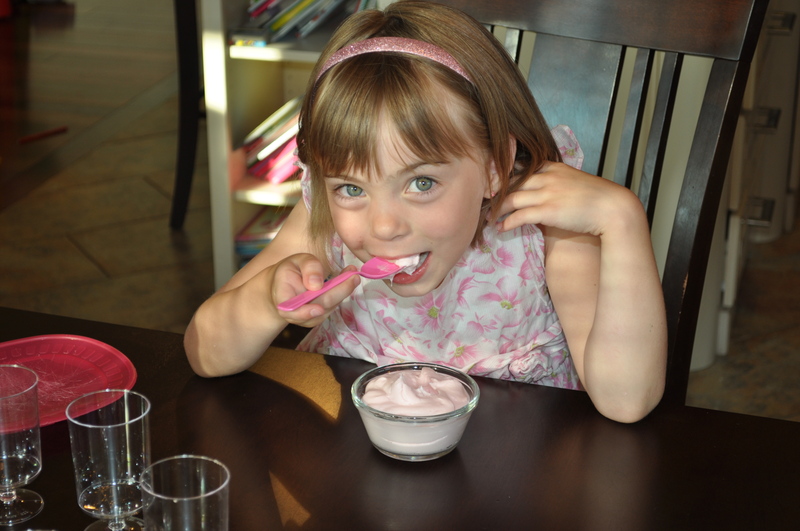 Finishing off with some yummy pink mousse (not mouse). It was a fun afternoon preparing and a fun dinner for everyone! 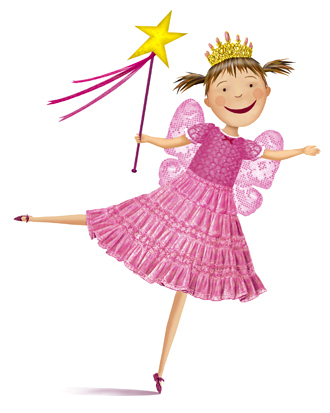 Now I think I may just have to take the girls to see the Pinkalicious stage show before the summer is over! 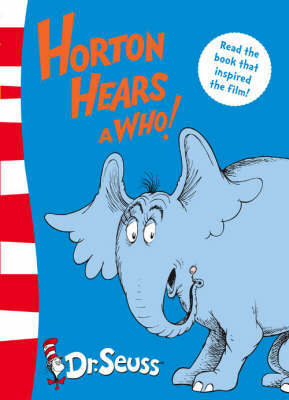 For challenge #3 we decided upon the Dr. Seuss classic Horton Hears a Who! This past April completed a Dr. Seuss unit with my Kinderoos and this is a book I didn’t have a chance to sad with them. Kaitlyn also got a number of Dr. Seuss books a few Christmas’ ago and this one we hadn’t looked at much. I had seen the movie on Netflix a while ago but it isn’t there now so we ended up purchasing the film from iTunes. We started by reading the book together. 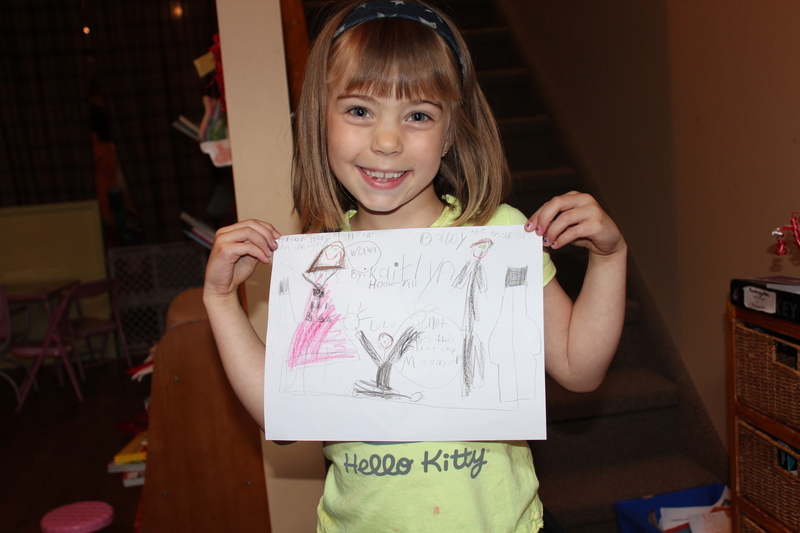 Kaitlyn had already seen the film at school but she didn’t remember much. Next they watched the film (I watched most of it with them but missed part putting Michael down for a nap). We didn’t have time to do much follow up so again today the kids watched the film and revisited the book. Next we went through the 6 guiding questions, and most of the answers are from Kaitlyn. The Who’s looked different, especially their hair. The Kangaroo also had different hair (she seemed fixated on everyones hair). After some prompting she did say that the characters were different colours. Our classic Dr. Seuss book has only white, black, blue and red so this is a pretty big difference. Finally she said the clover in the movie was purple as opposed to red in the book. On further investigation the clover is more pink in the movie and red in the book. This is a great question and one I often think about when seeing movie adaptations but I think it is a bit to abstract for my children. Kaitlyn’s quick answer was yes. I always find that when I watch films the accents sometimes throw me off! What parts of the story were left out of the film? Were there any extra parts in the film? This is interesting because often in adult adaptations much has to be left out due to time but when adapting a children’s picture book the reverse often happens and more has to be added to increase the length. 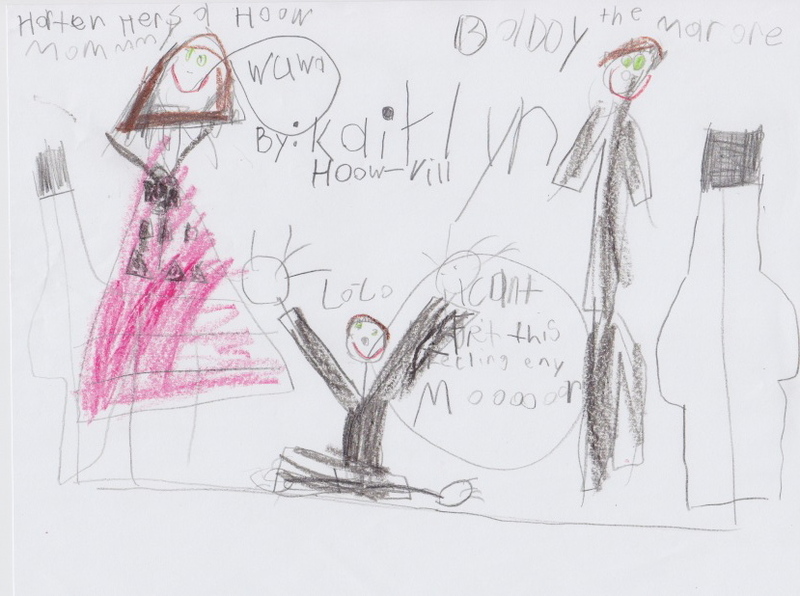 Kaitlyn’s biggest worry was that there was no snow in the book but there was in the film. She also came up with on her own that the cage they held Horton in was different. I found it interesting that she focused on the small details and missed some of the bigger differences. For starters there are a lot more characters in the film and one main character was changed. In the book JoJo is a little Who with no connection to other characters but in the film he is the mayor’s only son (and he as A LOT of daughters). She did come up with this with some suggesting but still seemed focused on the small details. The thing that struck me was that in the film Horton had an ultimate destination and was trying to get the clover up to the flower to protect it but in the book he was just trying to protect it without having a specific plan. The song at the end. My girls are obsessed with the song Can’t Fight this Feeling at the end of the film. If anyone knows where I can get a copy of this version please let me know. I played the REO Speedwagon version and even the GLEE version for them but they really want the Horton version. 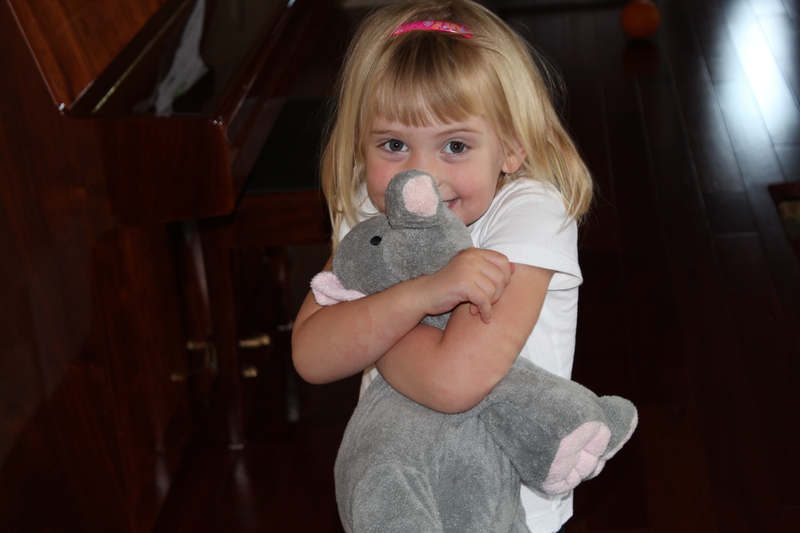 That the Mommy Kangaroo didn’t believe Horton. 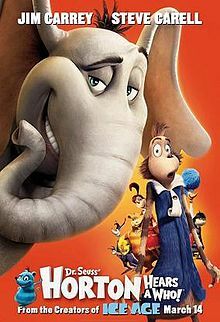 In both versions the Kangaroo didn’t believe Horton but it seemed much more exaggerated in the film – especially after the Who’s are heard by everyone else. What did you like better – the book or the film? Why? 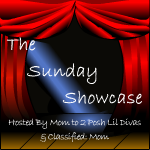 The Film – because of the song (I should have seen that answer coming). 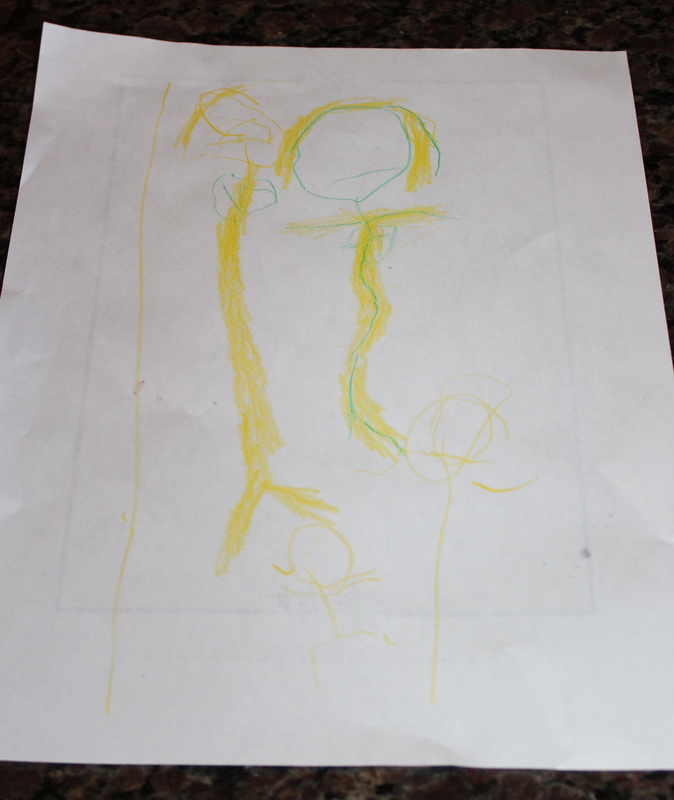 Kaitlyn drew a picture of her favourite part to share. It you read carefully it is Mommy and Daddy Who with JoJo in the middle singing “I Can’t Fight this Feeling Anymore”. 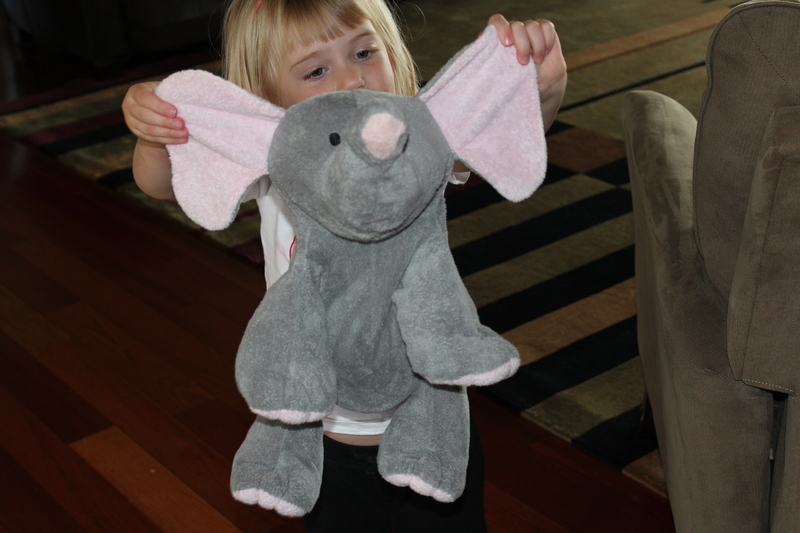 Eileen was more interested in renaming one of Michael’s stuffed elephants Horton (he seems to have a fair number) and running around the house pretending to get away from the other animals. It was quiet cute and her way of retelling the story! So we are way behind on everything! It is the long weekend and we have been working hard outside but had to come inside while Daddy was cutting the grass. Eileen asked to do a craft, and not just a craft in the basement but a ‘Mommy craft’ upstairs in the kitchen. I figured this was a great chance to do one of the many things we have been trying to get through. We decided to tackle challenge #2 from the Little Book Adventure. This was the challenge from April but it’s better late than never. We started by reading Surprise by Karen Andrews. I had ordered this book back at the beginning of April and hadn’t had a chance to read it to the girls yet – it is awesome and I would recommend it to anyone (international shipping wasn’t even too bad). It is the story of a number of children who each sign out the same library book and find a surprise picture from the previous reader – a cool idea. The girls each picked one of their library books we signed out last week and I read it to them. Then I printed off the letterhead for the challenge and wrote a note at the bottom so that the parent or librarian who sees the picture will know what it is. I am pretty sure not many people in our small town will be participating in the Litte Book Adventure so I wanted to make sure the reader understood what the picture is. I also placed the link to this blog so if you are visited because you saw our pictures we would love for you to comment! 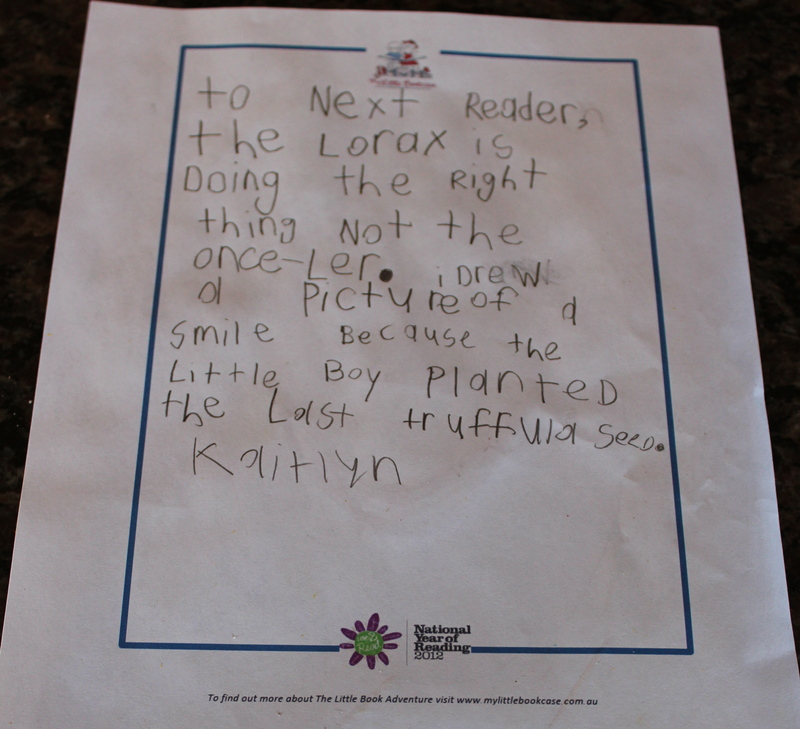 Kaitlyn picked Dr. Seuss’s The Lorax because she loves it and thought it would have the greatest chance of being signed out by another person. The challenge said to write a letter to the next reader but Kaitlyn really wanted to draw a picture so we did both! I helped her with spelling a few words but she did most of it herself. I love how she thought to looking the book to spell Truffula. 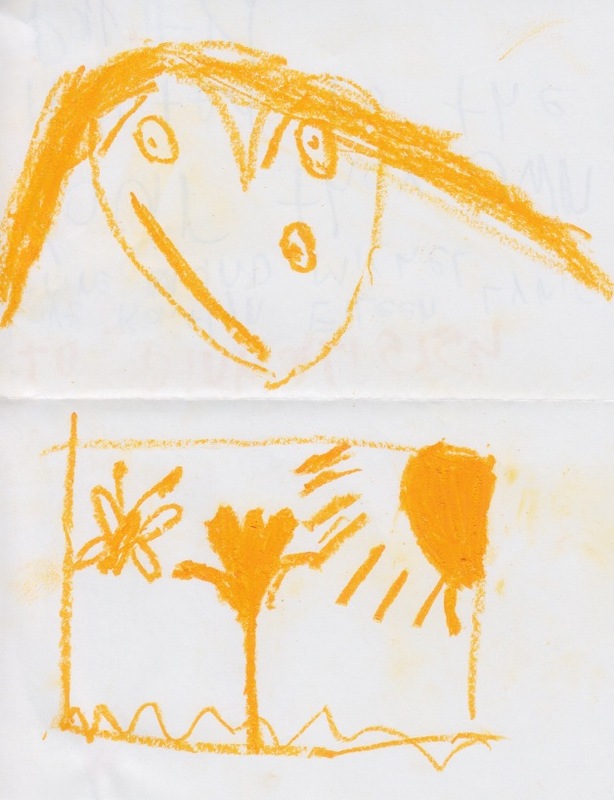 On the other side she drew a smiling picture because she was happy the little boy was planting the seed. I told her she could draw anything but she wanted to draw a smile because in Surprise the kids drew pictures of how they felt. 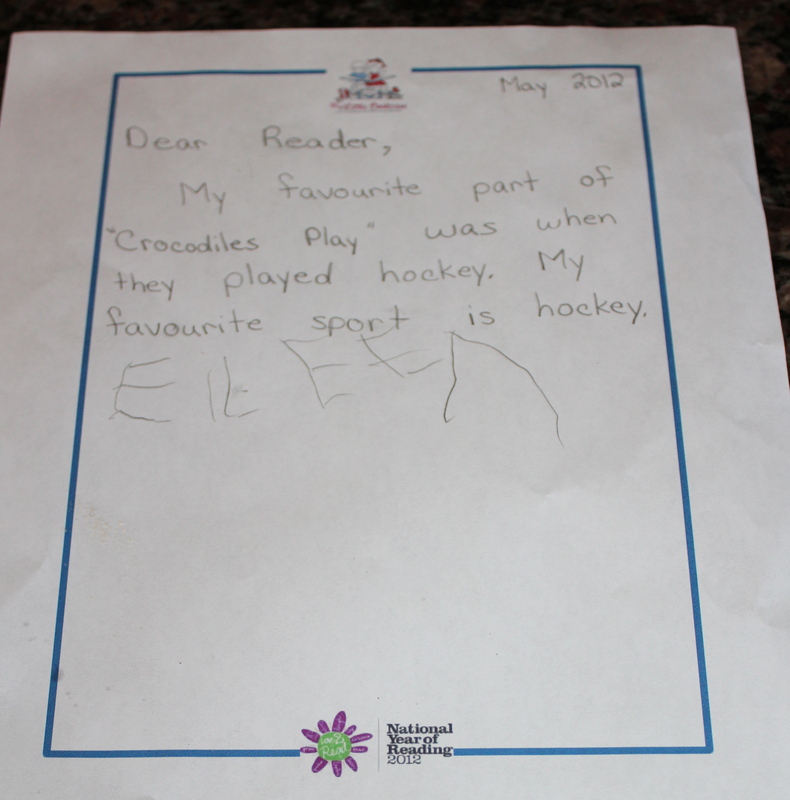 Eileen chose Crocodiles Play by Robert Heidbreder. This was Blue Spruce nominee from a few years ago. She needed a bit more help so I helped her with her letter. 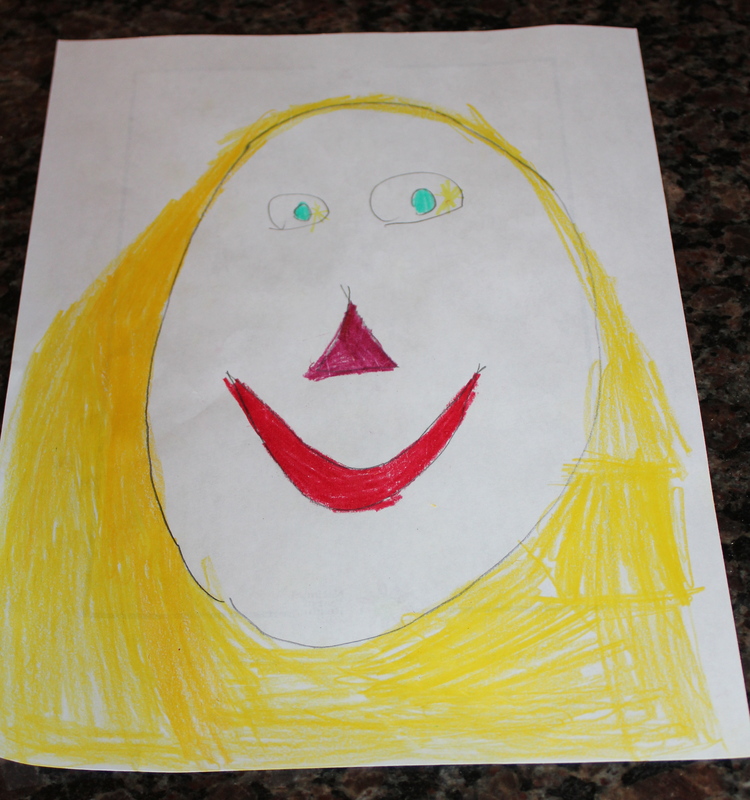 She started by saying she wanted to draw a picture of a crocodile but then came to the conclusion that it looked more like a person and changed it to a picture of her family. I am so excited that her people are starting to look like people. She has made huge progress with her fine motor skills in the past couple of months. She even signed her own name at the bottom of her letter!! This was a quick and easy challenge. I and looking forward to seeing what Challenge #3 will is? I now have a fair number of blogs that I follow through my RSS feeds and other methods. One of those I added a month or so ago is Honey Bee Books. Through this blog I found out about the Little Book Adventure of 2012. This is a cool initiative created by My Little Bookcase out of Australia. I know because we are in North America we will not be eligible for any of the prizes but for us that is not a reason not to participate. I am always looking for new and excited literacy projects and challenges with my kids and this is a perfect fit for us. So I registered us and we got started. Challenge #1: Get Creative with your book storage. We have A LOT of books in our house. It is a bit of a pet peeve of my husband’s but he has slowly learned not to complain when I bring home more books for the kids – he complaints are futile and fall on deaf ears. The problem we now have is that we have so many great kids books but are running out of places to put them. I am not ready to purge but I want to make sure we can find those great treasures when looking. This was a perfect task for us. 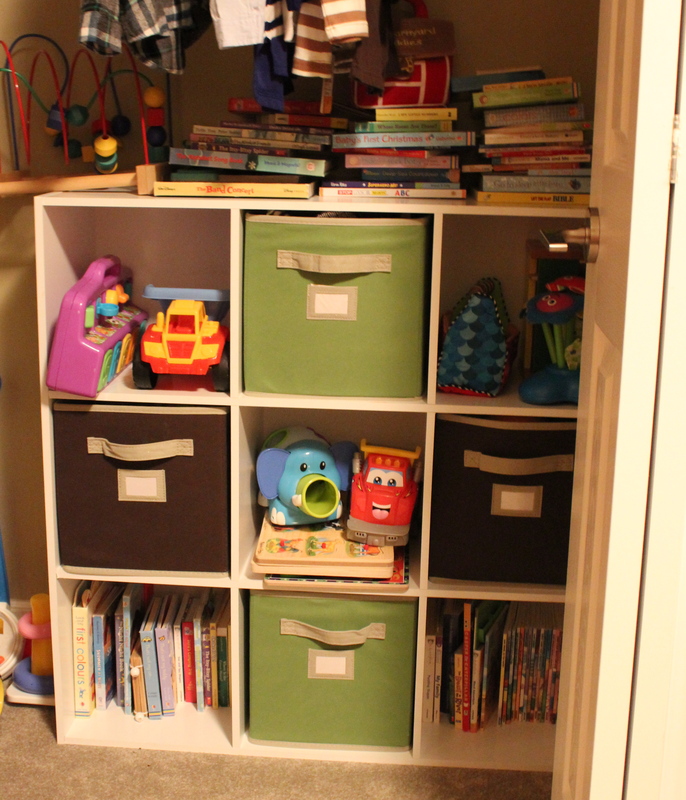 Most of the books are in the kids rooms but I wanted to start included some in our playroom so I hit pinterest for ideas on easy, and inexpensive book storage. I quickly came across rain gutter book shelves that would be perfect for the location I had in mind. I pinned a few sites but the most useful was at Raising Olives. She gives a great step by step guide for installing shelves and of someone as unhandy as me this was perfect. For full disclosure I didn’t end up doing most of the tricky parts. My dad is who I usually call on for all things handy and he did most of the cutting and installing. I also knew that I wanted to personalize the shelves for the kids and over at More than Mundane she shared with me how acrylic paint worked when she decorated her shelves. So they turned out pretty good. I am not an artist but I did manage to paint each child’s name on their shelf and then I let them decorate them with stickers I picked up at the dollar store. In total the three shelves, completely installed was less than $100. The gutters themselves are rather inexpensive but the brackets and the ends add up quickly. I wanted them pretty sturdy since little hands will be putting books in and taking them out so I used 3 brackets on each 5 foot shelf. I also put Michael’s shelf at the bottom so he can reach his books, and it also works best as he can’t reach Kaitlyn’s books – which he like to rip sometimes. 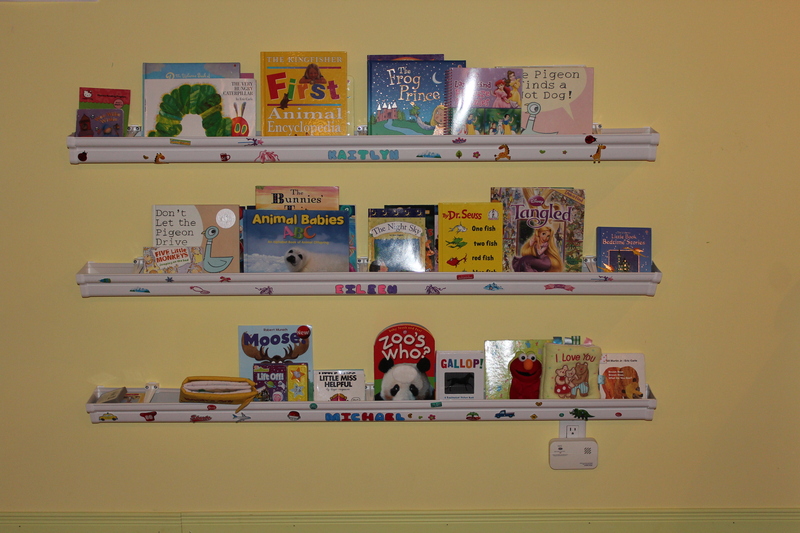 Our New Playroom Book Shelves!! Once the new shelves were up we decided it was time to organize ALL our kids books. These new shelves were going to hold feature books. Every month the kids can change which books they put in the shelves but these are to be their choices only (Mommy and Daddy have no say)! We have other book shelves in our house for kids books. 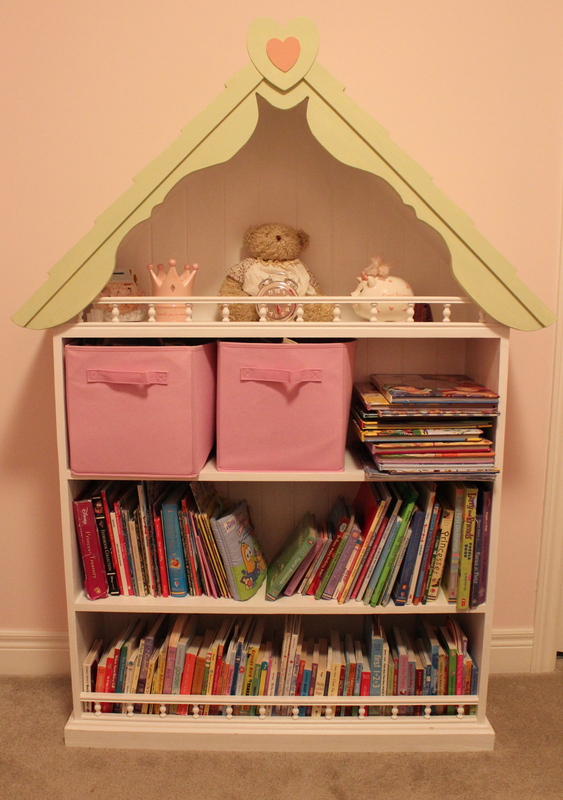 Right now both of the girls have castle book shelves in their rooms. We working on deciding what style to build Michael (and by we I mean Grampa who is the handyman). For now Michael’s book are just stacking on his toy shelf in his closet. There are a couple of other locations of books around the house. 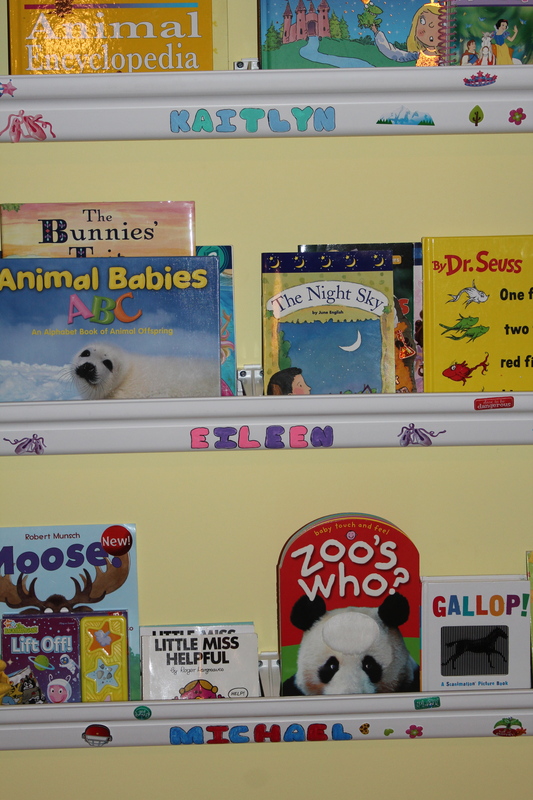 In the playroom we have a bin of mini board books that are at perfect height for Michael. In our kitchen island there is a shelf with ABC books the kids often read when I am planning dinner. Finally, in the great room there is a small unit that has book that I have picked out for the kids. These are often books we have done activities around or will be reading soon. 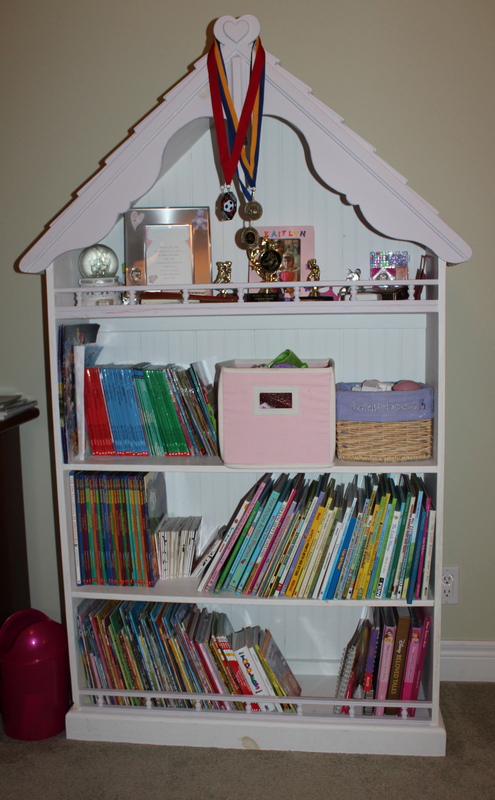 Any books that I blog about (and all our getting ready for Kindergarten book) will be added to this shelf. We had fun on our first challenge and look forward to challenge #2!